Kevin Harvick started third, finished first, earning 10 bonus points and a playoff point. The Mobil 1 Ford raced up to the second position on the restart and held steady until the competition caution at lap 30. The No. 4 Ford team took two tires and fuel during the competition caution and came off pit road as the leader. The team held the lead for the remainder of the stage to score its series-best 17thstage win of the season. Harvick came to pit road at the conclusion of the stage for four tires, fuel and an air pressure adjustment. Harvick started first, finished first, earning 10 bonus points and a playoff point. The No. 4 team chose to stay out following an early caution on lap 97 to keep the lead. Harvick surrendered the lead to come to pit road under green on lap 132 for four tires and fuel. He reclaimed the lead on lap 159 and continued out front from for the rest of the stage to score his series-best 18thstage win of the season. Harvick came to pit road at the conclusion of the stage for four tires, fuel and a wedge adjustment. He rejoined third behind Joey Logano and Brad Keselowski, who took just two tires. Harvick started the stage third and finished first. He kept pace with the leaders over the next 51 laps and came down pit road from third place under caution for his next-to-last scheduled fuel-and-tire stop on lap 228, rejoining the race in fifth. Harvick was fourth when the race restarted on lap 231 and he was motored his way back into the lead on lap 254, where he stayed for the next 27 laps before pitting a final time for tires, fuel and an air-pressure adjustment under green. Twelve laps later, Harvick was the leader once again as the field cycled through the day’s final scheduled round of pit stops. The No. 4 team elected to keep Harvick on track during three caution periods over the final 40 laps to the scheduled race distance and, each time, Harvick was faced with restarting in the lead alongside Ryan Blaney. On the lap-302 restart, Harvick chose the inside lane and was able to hold off Blaney, keeping the lead until the next caution flag flew on lap 306. Harvick again chose the inside lane on the lap-310 restart but, this time, Blaney was able to slip past for the lead, where he stayed until Harvick was able to get around him on lap 318. The caution flag flew a final time on lap 331, three laps before the scheduled 334-lap race distance, sending the event into overtime. ● Harvick chose the outside lane on that final restart and, after a Blaney was able to take the initial advantage at the wave of the green flag, Harvick powered his way around the outside and drove away for the win. Harvick will compete in the Championship 4 for the fourth time in the last five years. He won the championship in 2014. 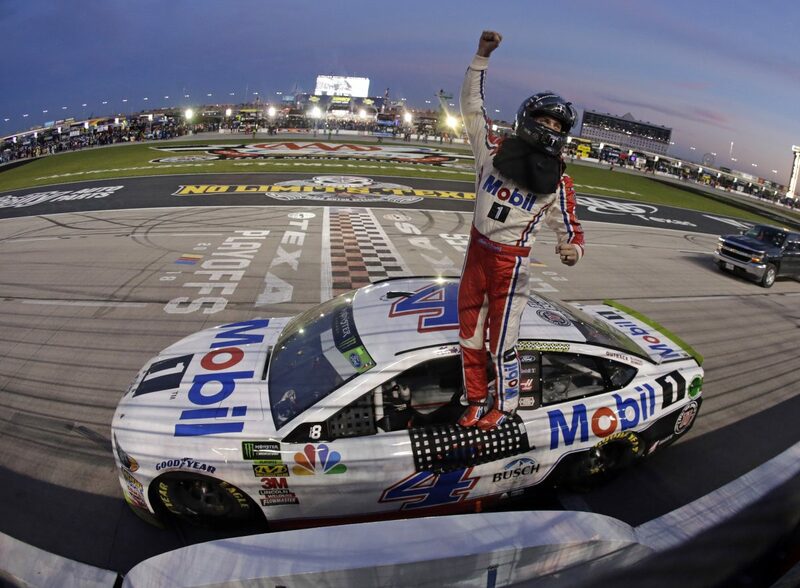 This was Harvick’s series-leading eighth victory of 2018 and his second victory in 32 career Monster Energy NASCAR Cup Series starts at Texas. Harvick won Stage 1 to earn 10 bonus points and one playoff point. He then won Stage 2 to earn an additional 10 bonus points and one more playoff point. Harvick leads the series in stage wins with 18, eight more than any other driver. Harvick led five times for a race-high 177 laps to increase his laps-led total at Texas to 495. Harvick’s victory in the AAA Texas 500 marked the 58thoverall win for SHR. It was the organization’s 51stpoints-paying Monster Energy NASCAR Cup Series win and its third victory at Texas. Harvick’s triumph delivered the 107thpoints-paying victory for Ford’s Fusion in the Monster Energy NASCAR Cup Series. It was Ford’s 676th all-time win in the NASCAR Cup Series. This was Harvick’s 45thcareer Monster Energy NASCAR Cup Series win and it gives him sole possession of 17thon the all-time NASCAR Cup Series win list. This was Harvick’s 22ndMonster Energy NASCAR Cup Series victory since joining SHR in 2014.